Sassi like an island in garfagnana @John : Sassi is a small village of about 200 inhabitatnts located between the east side of the Apuane Alps and the western side of the Serchio Valley in the province of Lucca, Tuscany, Italy. Coordinates: 44°4'58"N 10°23'32"E Nearby cities: Lucca, Viareggio, Pisa @ Cédric : yes, the one in the background is an electricity pylon. sherri (Homepage) wrote: wow, this is amazing. like an enchanted place. Ricard wrote: Fantastica imatge, podria ser perfectament qualsevol lloc del prepirineu lleidatà, en un dia de boira. Linda Bradshaw (Homepage) wrote: This photo makes me think of a movie I saw a long time ago - I think it was called "Brigadoon." Very magical. Marcie (Homepage) wrote: Again - I'm speechless. What an absolutely magical scene. Your point-of-view is amazing!! Olaf (Homepage) wrote: That is Tuscany, Gods place in Haven. An amazing shot. Great! Stacy (Homepage) wrote: I love your photos! fabrizio (Homepage) wrote: incredibile spettacolo.... inutile aggiungere altro!!!! April Michele (Homepage) wrote: Amazing perspective to be higher than the highest spot and capturing the clouds or fog. Yulin wrote: Okay, I'm speechless. 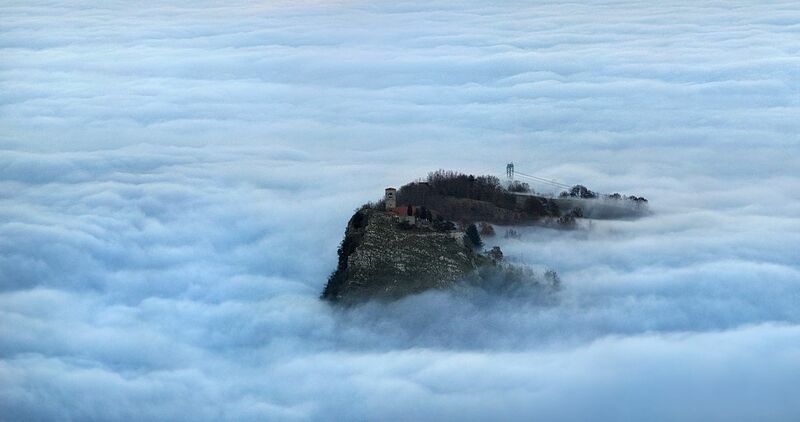 Wolfgang (Homepage) wrote: An isle in a sea of clouds. Wonderful shot and atmosphere! Arjan - PlasticDaisy (Homepage) wrote: This is spectacular! Makes one wonder where you were when you took this shot, as the village itself already seems to be in the clouds! Françoise (Homepage) wrote: Beatful. it seems a progression from one of your precedent image. the clouds were winning and now there is a lone survivving and resisting village. surnatural and nice colors! janina (Homepage) wrote: Wow...this is a dream...fantastic image! CrashRyan (Homepage) wrote: that is frikkin' wild! buntagphoto (Homepage) wrote: A floating world. tom (Homepage) wrote: Beautiful! An island in the clouds. Arnd (Homepage) wrote: Stunning capture of a breathtaking scene! Love your bird’s-eye view here. John B. (Homepage) wrote: Fantastic photograph but where is Sassi? Cédric (Homepage) wrote: What an amazing picture. I'm intrigued by what seems to be a bridge (or is it an electricity pylon?) at the back. JOHN (Homepage) wrote: great great capture.